Recycled mat board is a great choice whether you're looking for a unique, eco-friendly art medium, or simply want to use fewer virgin paper products in your life. Mat board comes in many variations, from two-ply paper to foam core. For this reason, many types of mat board are not accepted at some recycling centers, and some types of mat board are not available in recycled format. What Mat Board Is Recyclable? If using a product you can recycle is important to you, then make sure you purchase mat board made of 100 percent paper product. If in doubt, attempt to tear the board; foam cores will not tear and many recycling centers will not accept foam core mat board. Unused portions of foam-core mat board can be donated to schools or craft centers to be put to new use. Artboard: This type of board can have a recycled core, but is usually covered in fabric. 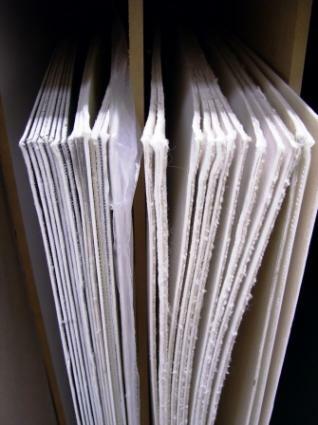 While fabric is non-recyclable, you can find art board covered in cotton, which is an annually renewable resource. Mounting board: The center of a mounting board is available in 100 percent recycled tree fiber content. Look for mounting boards with recycled paper coverings as well. Standard mat boards: Standard mat boards are available with both recycled tree fiber middles and recycled paper covers. Rag mat boards: Rag mat boards are available with recycled paper covers. Look for rag fillings made of cotton, rather than foam or a non-renewable substance. Use a mat board made of recycled and renewable materials in the same way you would a standard mat board. Depending on the size of your mat board needs, you may find that frame shops have leftover scraps of mat board available for the truest from of recycling. Many artists are able to create unique paintings using this material for a canvas; if you are unable to recycle your mat board, consider donating it to a local artist or art organization. Mat board is one product that gets used more frequently than most people realize. Look for recycled content products, or find ways to recycle the material you use to avoid wasting it.